This is just the job to warm you up on a freezing cold day – my last post was for a delicious comforting meaty stew however my good friend Liz has asked me for a vegetarian option and I think this would give a beef stew a good run for it’s money any day! One of the nice things about this dish is it is so quick to make plus it is a wonderful way of turning what are pretty much staple ingredients into a really tasty and wholesome meal. 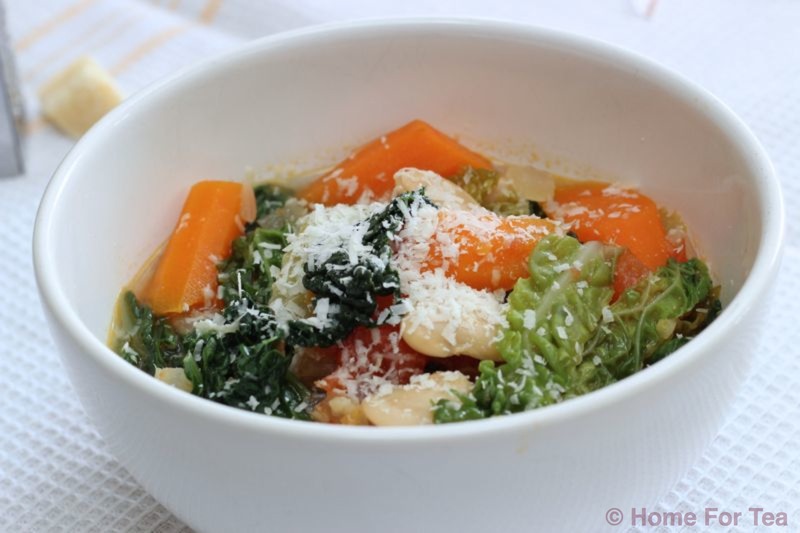 The name Ribollita literally means “reboiled”, in fact an authentic Ribollita takes about three days to taste its best – it was a way for thrifty Tuscan cooks to use leftover vegetables, bread and beans from the week. This is what you and your family need right now on these cold, wintery days. Warm, nutritious and comforting and really easy to make. Adding spinach to the soup has two purposes – it adds nutrients and it also gives the soup a lovely green colour. 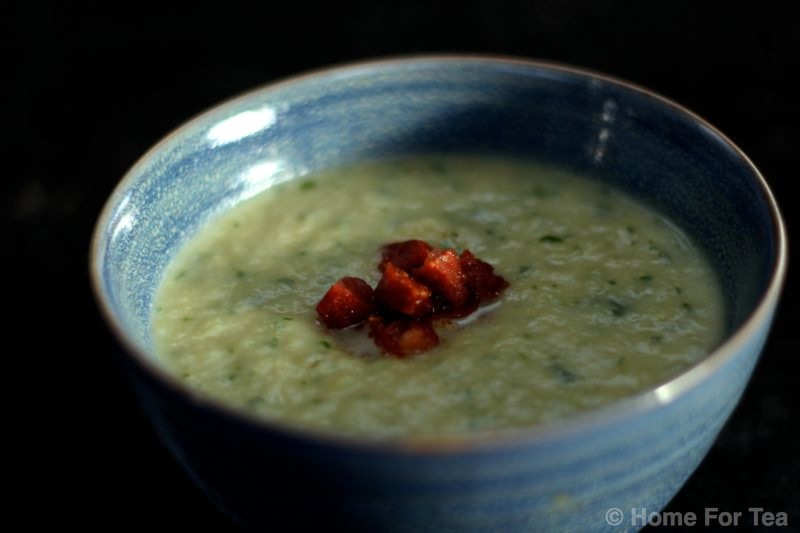 The fried chorizo cubes lift this ordinary soup into something special – I adore chorizo but you could also use fried bacon pieces or if you want to make it fully vegetarian or vegan just leave these out and use water or vegetable stock instead of the chicken stock. Add the stock and bring to a simmer, put the lid back on and simmer gently for approx. 20 minutes until the vegetables are soft. Add the milk and the spinach leaves and simmer for a further 5 minutes. Liquidise the soup using a blender. Heat the chorizo in a dry non-stick pan for 2/3 minutes (it won’t need any oil as it will release it’s own) until it is nice and crispy to serve. Enjoy! This isn’t technically a recipe as it really just a matter of combining the ingredients. 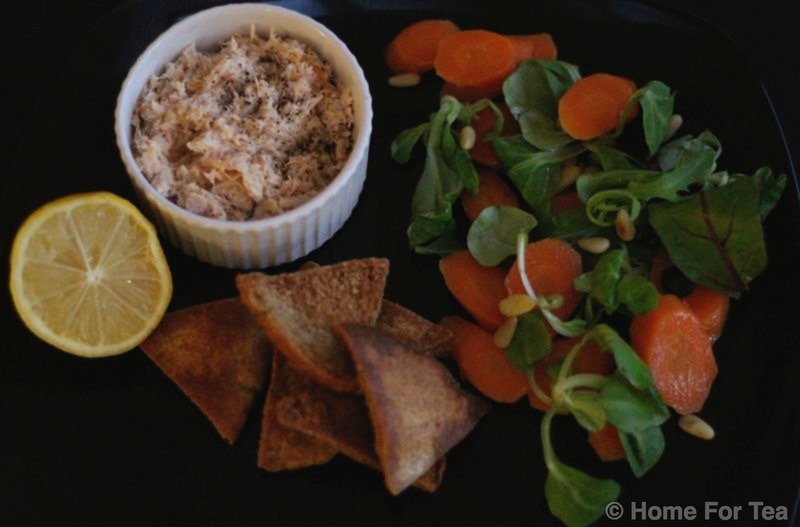 No cooking skills required and no need to stick rigidly to the quantities specified as any combination of these ingredients will result in a delicious end result. How good is that! And, as if that wasn’t enough, it’s made in minutes, i.e. real ‘fast food’. Halloumi is unlike any other cheese as it holds its shape and doesn’t melt when heated. 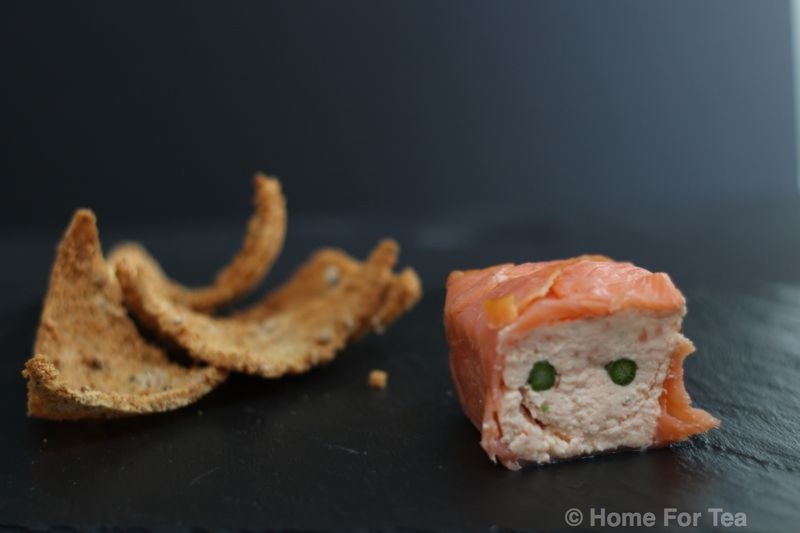 It has a delicious salty flavour and it makes for a very quick, healthy and filling snack or lunch – it has a reasonable shelf life so it is great to have it on standby in the fridge for those days when you are starving or short of time or both (happens regularly to me). It goes very well also with fresh beetroot which you can get in vacuum packs and which is another great standby to have in the fridge as it lasts for weeks in the fridge. Time to prepare: approx. 10/15 mins. Cut the tomatoes* into halves and then into quarters. Remove the seeds and chop the flesh into small pieces. *If you have time remove the skin by placing the tomatoes into boiling water for approx. 30 secs at which stage the skin will just peel off. Cut the avocado in half, remove the skin and the stone and cut the flesh into cubes. Place the tomato, avocado and coriander in a small bowl, add a good squeeze of lime and toss gently. 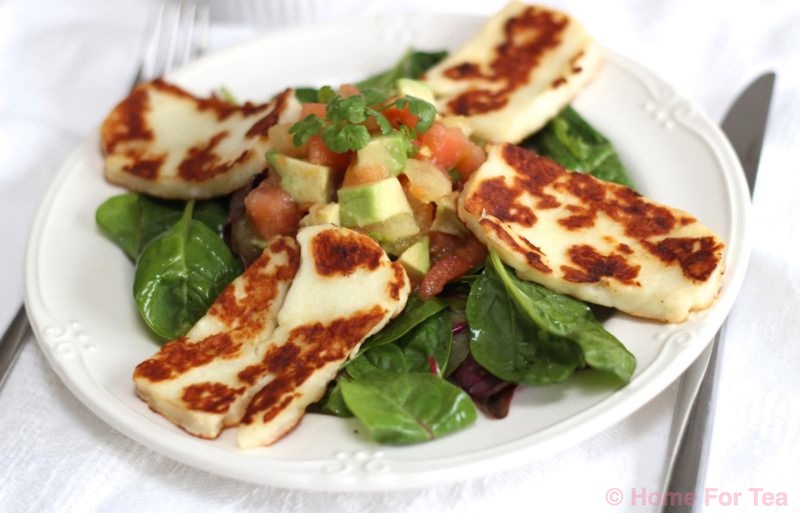 Cut the halloumi into slices and heat a non-stick pan (no oil needed). Place the cheese slices onto the hot pan and fry until a nice golden colour on each side. Put the salad together by placing some dressed salad leaves on a plate. Place the avocado salsa in the centre and arrange the warm cheese slices around it. You have probably guessed already that food is an obsession of mine and plays a kinda big role in my life i.e. if I am not eating it, I am thinking about it! Apart from needing it to stay alive, food can be important to people for many different reasons. For example in our house at the moment it seems that there is a never-ending conveyor belt of different meals required and it is quite the full-time job trying to think of what to feed everyone and keeping the fridge stocked (there is only 4 of us!!). Darling daughter (DD) is in study mode for the Leaving Cert so as well as needing food to keep her fit and healthy, food is a real source of comfort in a gruelling schedule and can often be the highlight of her day. Darling son (DS) plays Senior Football(Gaelic) for which he trains 6 or 7 times a week, needs large amounts of carbs and protein for energy, strength and recovery – he seems to be always foraging in the fridge! This ‘soup’ which is a meal in itself keeps everyone happy whether it is for lunch, pre or post training or for supper. My daughter adores it as do I, it tastes great and takes just 2 minutes to re-heat in the microwave. Perfect for taking to school or work and really easy to make. 150g (5oz) tinned haricot beans, drained & rinsed in cold water. Chop / cut the pancetta into small pieces (approx. 2cm) – a scissors works best for this. Add the chopped onion, garlic, diced leeks, carrots & celery and the bacon pieces. Cook for 10 minutes over a low heat without colouring, stirring occasionally. Add the drained & rinsed haricot beans to the pan. Add the stock and tomato purée and bring to the boil. Reduce the heat and simmer for 15/20 minutes until the vegetables are tender, stirring occasionally. 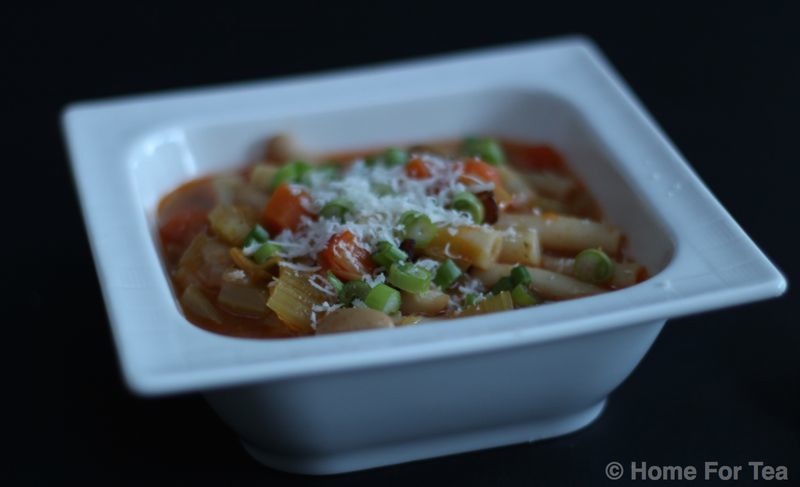 Stir the pasta into the soup and simmer for another 10 minutes until tender, stirring frequently. Serve with parmesan cheese grated over the top. You have only to look at the colours in this dish to get a nice warm feeling and that it would fit the bill perfectly for lunch on a cold Winter’s day. I made this dish to bring to work for my lunch and I got two of these containers so 2 days’ lunches were sorted. I really like to try and bring my own food to work for at least 2/3 days a week from a healthy eating point of view and also from the cost point of view – I can easily spend €50 a week on good coffee and bad sandwiches! An added bonus is that the ingredients (apart from the fresh coriander) are either store cupboard ingredients i.e. coconut milk, tinned chickpeas or vegetables that have a good shelf life i.e. sweet potato, butternut squash, onion, garlic. These are ingredients that I would always have in the press because they are so versatile and can be used in lots of dishes. 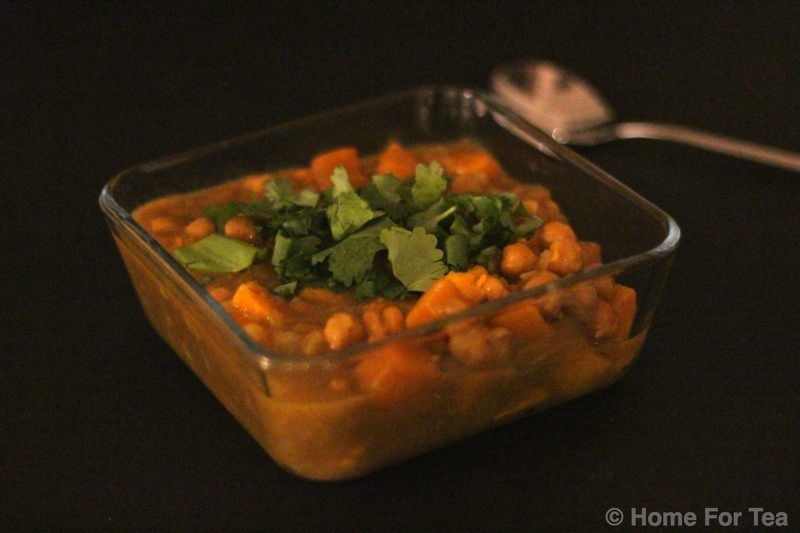 This stew is vegetarian and vegan so can go towards one of your weekly meat-free meals. Place a large pan over a medium heat and add the olive oil. Add the onion, season with salt and pepper and sauté gently for 6-8 minutes until tender. Bring back to a steady simmer and cook for 15 minutes or until the vegetables are just tender. *If you are making this like I was to bring to work don’t stir in the coriander until you are re-heating it.